Find SPDR S&P 500 ETF Trust review. This exchange traded fund invests in stocks of U.S. companies listed in the S&P 500 index. Index ETFs are popular among investors. These exchange traded funds provide low cost opportunity for investors to invest in diversified selection of stocks. Investors can buy these index ETFs with as little as $100 or less. You can invest in U.S. stock ETF, international stock ETF, bond ETF, municipal bond ETF, emerging markets ETF, etc. 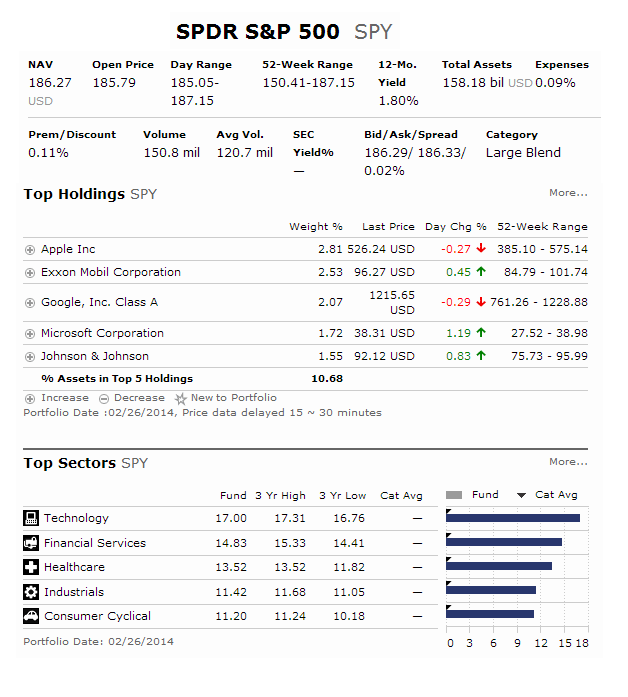 One of the most popular ETF is SPDR S&P 500 ETF (Ticker: SPY). This index ETF is one of the oldest ETFs. Is this ETF fund suitable for your brokerage account or retirement account or not? Find the review below. I have provided in depth details about the fund performance, expense ratio fee, top holdings, and more. Was Your Last Investment Designed with the Same Meticulous Attention to Detail? Some design flaws are so obvious, you have to wonder how they were able to pass inspection. Investments are no exception. After all, who wants to invest in a watered down version of what they expected? Twenty years ago, State Street Global Advisors created the first exchange traded fund: the SPDR S&P 500. It offers a more precise way to buy and sell an entire index, but is traded like a stock. Today, there are more than 120 other SPDR ETFs that cover a range of asset classes. So you can be sure you’ll get just what your portfolio needs. 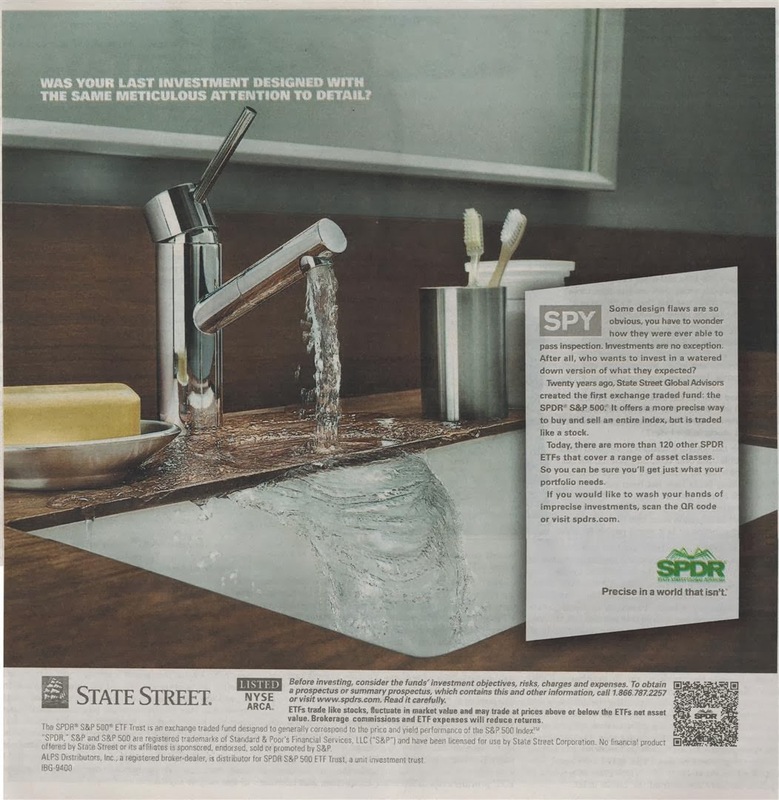 If you would like to wash your hands of imprecise investments, scan the QR code or visit spdrs.com. SPDR – Precise in a world that isn’t. This SPDR S&P 500 ETF fund was introduced to public in January 1993. This exchange traded fund seeks to provide investment results that, before expenses, generally correspond to the price and yield performance of the S&P 500 Index. The total net assets are $155.33 billion. It also has annual expense ratio of 0.09%. The fund is currently traded at discount -0.13% from its NAV. The CUSIP is 78462F103. The dividend is distributed quarterly. This U.S. stock fund is rated with 4-stars rating by Morningstar. The YTD return is -0.90%. It has 15-year annualized return of 4.46% and 5-year annualized return of 21.06%. Last year, 2013, the fund returned in 32.31%. The current share price is $186.30. The top 5 stocks in its holdings as of February 19, 2014 are Apple Inc (2.96%), Exxon Mobil Corporation (2.51%), Google Inc Class A (2.07%), Microsoft Corporation (1.75%) and Johnson & Johnson (1.58%). The top index sector allocations are Information Technology (18.96%) and Financials (16.08%). Investing in this SPDR S&P 500 ETF provides great opportunity for investors. This ETF has a low expense fee. It is ranked among the best ETFs.